I believe in tangible ways to pray. Jesus used things he saw around him to teach his followers and used these every day things to help them see God. So why not Halloween candy as a prayer tool? Since Halloween is upon us and whether or not you choose to embrace Halloween as a holiday or an event, you can still use all that great Halloween candy to help you pray, as a part of your youth group, your family devotion, small group or even in your personal prayer time. 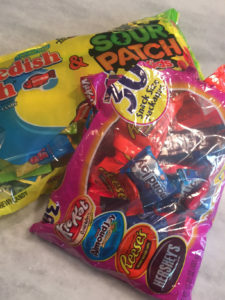 And post Halloween is a great time to buy up candy to use for future prayer experiences and ideas. I use sour skittles and m&ms for end of year prayers (future post…thanking God for the sweet and sour for the past year) and tootsie roll pops for advent prayers. Are we willing to wait on God to get to the good stuff of Jesus at Christmas? You can find more in Advent Waiting Prayer Experience at Freerange Worship. Today we are praying with candy, and since chocolate is my love language, lots of chocolate prayers. These are just some ideas. See what they might spark in you and feel free to morph and change them. I’d love to hear about how you use these. Have a chocolate today, or another favorite candy and Taste and see that God is good! Have a bowl of mixed halloween candy, at least one piece for each person. This meditation can be done with a group as a corporate prayer or as an individual prayer station. Remember that younger students are much more concrete in their thinking and probably works better with high school and beyond, but don’t be afraid to try it with younger students just give them more examples and guidance of what you are going for since they don’t all think in metaphor/comparisons yet. If you are doing this prayer activity with a group, be aware of any nut allergies and have an alternative choice or avoid the nuts completely. The candy choices will also be determined by where you live. So think about the varieties that can be used for prayer! I was just thinking about how much better the UK Kit Kat bars are than ours here in the States! Small Hershey bars, kit kat bars, m&ms, mounds, regular skittles, sour skittles, tootsie rolls, tootsie roll pops, mini snickers, mars, etc. One idea is to have each person in the group choose a piece of candy out of a mixed bowl of candy. Another way to go is to have everyone have the same type of candy and do a prayer with that particular candy. Example 1: Praying with Kit Kat Bars. How do you share your gifts with others? With Whom do you need to break off a piece of the kit kat bar and share? How is God inviting you to share your life with other people? Give participants time to reflect between each question, or have the questions written out and have participants write their responses and then after a given time invite people to share their thoughts with the group. Example 2: Pick out a piece of Halloween candy. Consider how your life is going right now, how is your life like that piece of candy? Consider the flavors, the textures of that piece of candy. Is life feeling plain not very exciting like a plain Chocolate bar? Or maybe it’s feeling nutty? Like a bar with almonds or and an almond joy? Are you sharing your life, like your real self, who you are with anyone? Like sharing a kit kat bar? With whom would you like to share your life? Your time? How would you like to serve or give to others? Talk to God about this. Is your life an adventure like different flavors of skittles? How would you like to add more flavor or more color to your world, to your life? Talk to God about this. Ask God to begin to show you the adventure ahead of you. What color or flavor represtents your life right now? Is life hard? perhaps life is rather hard to endure like a chewy tootsie roll…or does it have the potential for adventure and unknown like a tootsie roll pop? What things are you chewing on right now? What questions or problems are you facing? Talk to God about this. Ask God for help. Maybe life is colorful like a handful of m&m’s with lots of great things going on. Talk to God about this. What are some of the great things that you’ve experienced lately? What are you thankful for? Take some time and thank God for these things. Some candy combines lots of flavor and textures together. Like Reeses or Snickers. Consider your week. What things have you experienced? How have you seen God in these things? There are the good things? What are the bad things? What are the plain boring things, and the sweet and sour things that occur all week long? God is present in all of them. Take some time and consider your week. Where did you see God? Talk to God about your life. Take some time…consider, think about your life. Where have you seen God at work even in the plain and boring parts. Even in the sour parts of your life? Thank God for being there in all aspects of your life. Eat your candy and thank Jesus for all that he is up to in your life and all the wonderful flavors in our world. Digging Deeper this week: Consider the justice issues around Halloween treats. What about people without candy? Or about the people who produce the chocolate for your favorite treat? Where does the candy come from and who is producing the chocolate? We can all be more aware of areas of pain and suffering caused by the mass production of chocolate and sugar. And we can consider buying fair trade chocolates as a part of our justice practice. PRAYER 2: Have example candy types/mini candy bars displayed, empty candy wrappers, pieces of chocolate to taste. Look at and Think about the candy on the table. Now consider you life with God, your relationship, your journey with Jesus. Which candy reflects your life with Jesus? Your life with God…Is it good and rich like your favorite candy bar? Or maybe your life with GOD is like an empty candy wrapper with nothing inside. Is it plain and boring like a plain candy bar? Or maybe it is rich like dark chocolate? Maybe life is rocky, you know filled with nuts. Or hard to chew because of the nougat and caramel. Is your life with Jesus tasting sour like sour skittles or sweet like m&ms? TALK TO GOD about this. Tell God where you are and then tell Jesus where you’d like to be on your journey with Him. Take a piece of chocolate. You can use chocolate chips rather than small candy bars depending upon the size of your group. Eat the Candy. TASTE and SEE that the Lord is GOOD. Jesus longs to be in relationship with you. You just have to open the door to your life and ask Jesus to come in. EAT the chocolate as a symbol of your willingness to start a relationship or get back on track in your relationship with Jesus. In the movie “Forest Gump,” Tom Hank’s character says “life is like a box of chocolates, you never known what you are going to get. “ Consider your life and compare it to a box of chocolates. Maybe the pieces of candy that you have tried out of the box have been gross, maybe you were expecting a piece filled with rich chocolate and you got a piece of slimy fruit filling instead or you were expecting plain and got nuts instead. TALK TO GOD ABOUT THE BAD pieces of chocolate, the bad pieces, the negative pieces of your life, both in the past and going on now. God’s not afraid of your feelings. God wants to hear you. God is listening. Thank God for both the good things and the yucky things happening in your life right now. Ask Jesus to show you where he is and what he is up to in your life. TAKE the TIME TO LISTEN to Jesus. Maybe you’ve felt like an empty box of chocolates rather than a full box. Talk to JESUS about this. Ask Jesus to fill your life with new things and show you what he is up to in weeks ahead. When you see a candy box, and candy bars in the store, Let them remind you that God is filling your box with GOOD THINGS. Let the Candy box remind you that God is at work in your life. Know that God is working and filling your life with God’s love! YOU are not empty, you are not a rotten, gross piece of chocolate. God created you to be God’s favorite.